Facebook allows its users to "Like" stuff. From musicians to cars, it is really easy to convey one's appreciation for something by clicking the "Like" button. Unfortunately, this convention is an all or nothing experience. What if there was a way to communicate a more accurate view of your tastes? Instead of liking something or not, you could pick a spot somewhere in between and explain why you feel that way. Let me introduce Bubbalon. 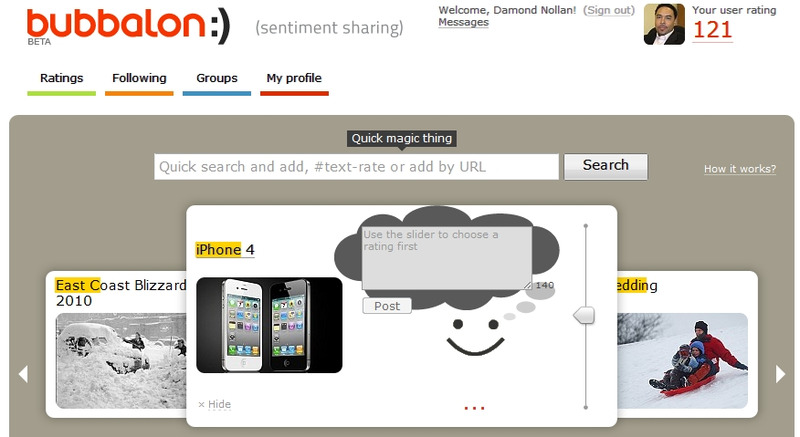 Bubbalon is a web-based tool that calculates your friends', as well as strangers', feelings on anything. How do you feel about the iPhone 4, snow sledding, or blizzards? With Bubbalon, you convey your emotions via a sliding scale that runs from 1-100 (or atrocious to awesome). In the image shown below, I created an item for damondnollan.com. I have the flexibility to slide the bubble up or down to match my feelings about the site. Of course, in this example, I gave my site a 100%. My friends, on the other hand, gave the site a score of 79%. In addition to the sliding scale, users can include a 140 character explanation for their score. Together, these features provide a valuable insight into why people feel the way they do. Note: Want to share your feelings about damondnollan.com? Click here to try it out. Every registered user, receives a profile page (see image). This page shows your profile picture, bio, social media sites, overall mood, karma score, friends you follow, and ratings (with comments). Bubbalon is more than just a rating site. Equipped with a search box, visitors can quickly find out what their friends, and the world in general, think about a particular item. It is a tool that seeks to promote our feelings over reason. For bloggers, product owners, and customer service departments, knowing how people feel about your product is an important aspect of making it better.